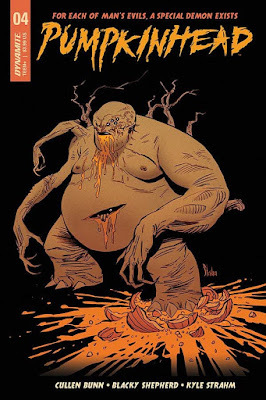 Pumpkinhead #4, written by Cullen Bunn, is my personal favorite in this series so far. This issue shows Haggis running away from the demon Pride, who has come after her. In the previous issue, Haggis’s sisters had summoned the other demons to roam the earth, who were jealous of the way Pumpkinhead, the demon of vengeance, was invoked more than them. Therefore, they decided to attack Pumpkinhead and his keeper, as well as those who may stand in their way. As Haggis tries to escape from Pride’s clutches, Pumpkinhead comes in out of nowhere to defend her, resulting in an epic battle between the two demons. Meanwhile, Sheriff Andi and Deputy Daryl are with the Kinkades, battling with the demon Greed. Although they fight hard, not everyone survives. It soon becomes clear why the demons were never meant to be on the earth at the same time. As the demons destroy those in their path, who will remain to stop them, and just how will they go about doing it? I have to admit I was disappointed that Bedelia was pretty much non-existant in this issue, as she is one of my favorite characters. However, it was entertaining to see more of Sheriff Andi’s personality shine through. I enjoyed seeing her take-charge attitude as she helped to fight off Greed as he wrecked havoc in the Kinkade household. It was awesome to see her put everything she had into going after the demon, and it was humorous for me to see her even throw her gun at him when she ran out of bullets. I admired the way she strove to save as many people as she could. The illustrations by Blacky Shepherd are extremely lifelike, especially the facial expressions, Haggis’s in particular. My favorite part of this comic was the battle between Pride and Pumpkinhead. It was like watching a movie, where one minute Pride was winning then the next Pumpkinhead was, and you were constantly wondering who would come out on top. The colors by Arancia Studio were bright and vivid and brought the scenes to life with their environments. I personally liked the scenes at night with Haggis. The use of shadow and light are superb. It really makes it come alive and adds to the spookiness of the scene. I was also pleased to see the continuing short story at the end of the comic, which is a fun added bonus. 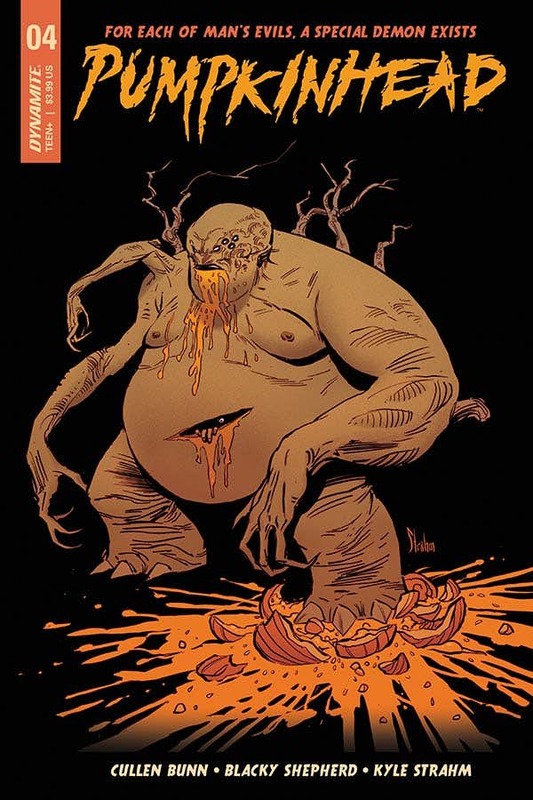 Pumpkinhead #4 is available for purchase May 23, 2018.